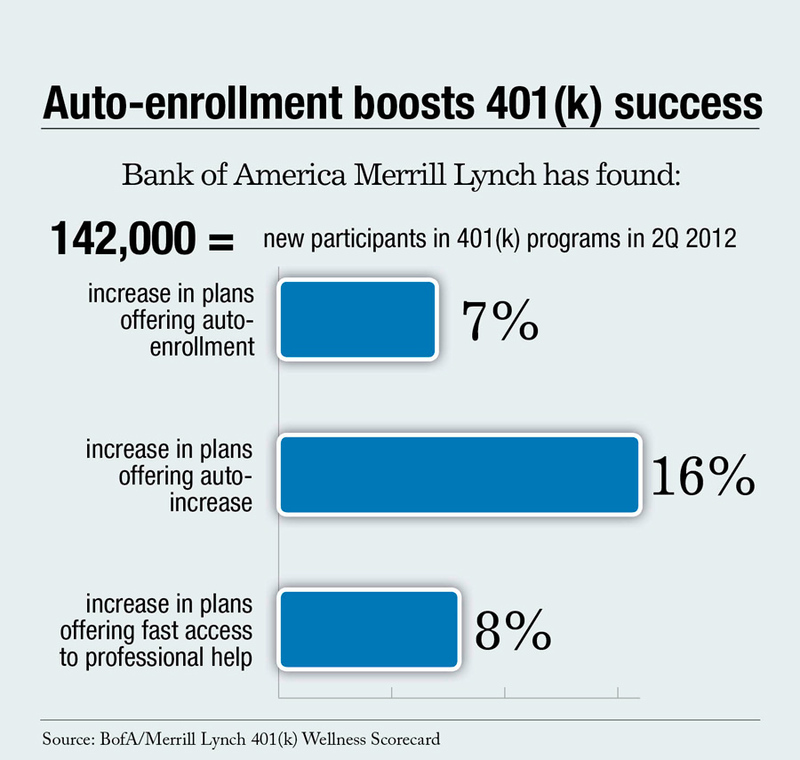 Bank of America Merrill Lynch's new study shows that auto-enrollment features and investor education have produced better engagement and participation. As the deluge of information is set to unfold for 401(k) plan participants, have employers been doing a good job of enticing their workers to take part in savings programs – and are there easier ways for those participants to become informed consumers? Bank of America Merrill Lynch’s new 401(k) Wellness Scorecard has found a significant increase in the number of employees participating in defined contribution plans and a marked jump in the contributions of those workers taking part. At the heart of that increase – more than 142,000 new participants (or individuals upping their participation) in the second quarter of 2012 alone – is the growing popularity of automatic features, according to Michael Liersch, director of Behavioral Finance for BofA/Merrill Lynch. “Enrollment and participation in defined contribution plans has remained strong due, in part, to plan enhancements including features such as auto-enrollment, auto-increase, and access to financial advice – which not only simplify investment decisions, but enable participants to focus on the essential information needed to develop the right investment approach,” he said. In a one-year period, researchers found that there had been a 7 percent increase in the number of plans offering auto enrollment, a 16 percent jump in the number of plans offering auto-increase and an 8 percent jump in plans providing better access to financial professionals for participants. Liersch said automatic enrollment is one of the best tools in increasing engagement. “Auto-enrollment provides tangible benefits in at least two ways. First, it enables employees to more easily engage in savings behaviors that can help them reach better retirement outcomes. Critically, employees seem to want to engage in these savings behaviors – about 90 percent of auto-enrolled employees continue to actively contribute. Of equal importance, Liersch notes, is the ability for participants to effortlessly get access to the input of associated financial professionals in their retirement savings decisions – within the context of their employer’s plan. Bank of America Merrill Lynch’s version of the expert self-help option is known as Advice Access, with independent and personalized input created for each participant by Ibbotson Associates. Participants can choose from three levels of involvement – “do it for me,” “do it with me” or “do it myself” investment styles are all accommodated – and the system also provides a goal-management system with targeted asset allocations. Liersch said these kinds of retirement recommendations go a long way to building engagement and keeping employees from doing nothing at all, the biggest danger in retirement planning. Most importantly, a service like BofA/Merrill’s also allows participants to dig into the research and education on their own time or on a tablet, while traveling. The system is also an important tool to plan sponsors, who can use the company’s Financial Wellness Monitor to gauge the overall success of participants and lend a helping hand, where necessary. As further evidence, the report shows a significant difference in investment styles (and potential long-term outcomes) between participants taking part in the advice-enhanced model and those simply making their own decisions. Of those going at it on their own, 30 percent had their investments concentrated in a specific asset category and 10 percent were over-concentrated in company stock: those in the Advice Access program fared much better in diversification of assets, and were also seen to be making better use of target-date funds. Finally, as a positive prospect for upcoming industry wide fee disclosures, the Scorecard’s authors say that more than a half-million Bank of America Merrill Lynch investment customers have opted to sign up for electronic delivery of educational materials, with more than 2,000 participants signing up each day.